Cartridge gun dispensers are designed for the controlled application of pastes, gels, adhesives and fluids. High quality cartridge gun dispensing systems. Our guns are covered by a one year warranty and supplied with a basic starter component kit. The TS16 gun is a hand operated, high quality metal dispensing gun designed to accept cartridges for the manual application of sealants, adhesives, potting compounds, and other materials packaged in disposable cartridges or Techkit, Semkit multi-component materials. They are excellent for the in-field application of silicones, sealants, adhesives, pastes, and other materials. The ratchet handle is made of metal for tough, durable, long-term use. A bayonet retainer provides a tight fit into the ratchet handle, permitting uninterrupted operation. Custom size retainers accommodate 2.5, 6, 8 and 12 ounce size disposable cartridges. Cartridges allow use of standard nozzles. Needle tip adapters can also be used with the cartridges for attachment of all standard needle tips. All guns are all covered by a 12 month manufacturers warranty. Cartridges are inserted into the cartridge gun threaded metal retainer. This ensures the cartridge does not move under constant use from hand pressure. Available in 5 sizes, 2.5oz, 6oz, 8oz and 12oz. All products are industrial grade and are covered by our no-quibble One Year warranty. 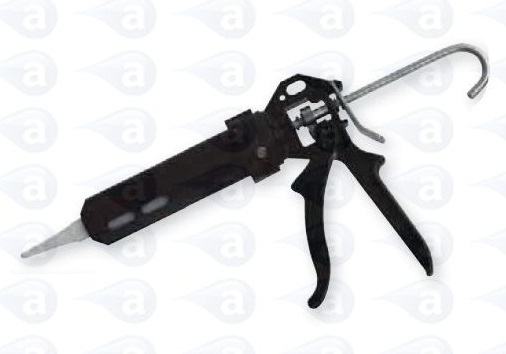 The TS16 manual cartridge gun is a hand operated, high quality bayonet retainer designed to accept cartridges for the manual application of sealants, adhesives, potting compounds, and other materials packaged in disposable cartridges or Techkit/ Semkit multi-component materials. In various sizes. Typical Applications: Guns are portable and can be used in a factory production or maintenance area, in an assembly department as well as for repair and re-work. Guns are commonly used in the field for repair or maintenance applications. Common applications include:- Deposits of solder paste, Deposits of solder flux, Grease to bearings, Potting components with epoxy, RTV to edge seams, Silicone shots to bond products, Gasket sealant repair, Aircraft maintenance work, General adhesive applications. General Use: Guns are portable and can be used in a factory production or assembly department as well as for repair and re-work. Guns are commonly used in the field for repair or maintenance applications.